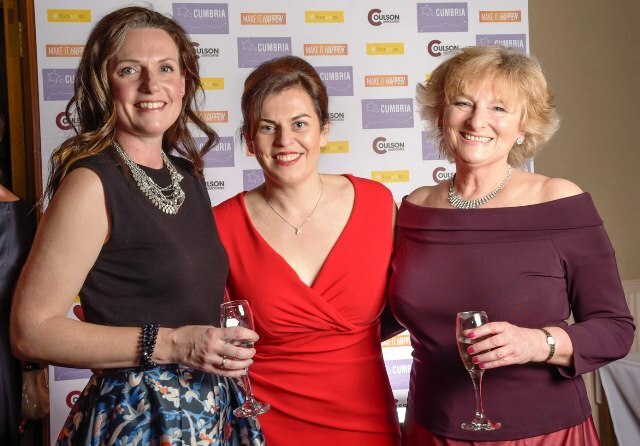 ‘I gotta feeling’ by the Black-Eyed Peas rocked out from the speakers as Sue Coulson, Janett Walker and Sophia Newton stepped onto the stage to announce the start of the very first Cumbria Family Business Awards. 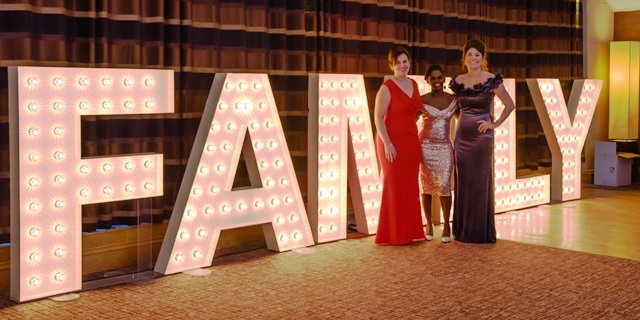 Sue, whose company, Coulson Associates was one of the CFBA sponsors, Janett and Sophia had worked tirelessly for many months in the run-up to the ceremony in March 201 7. “From over 100 applications we had to whittle it down to about 30 finalists. 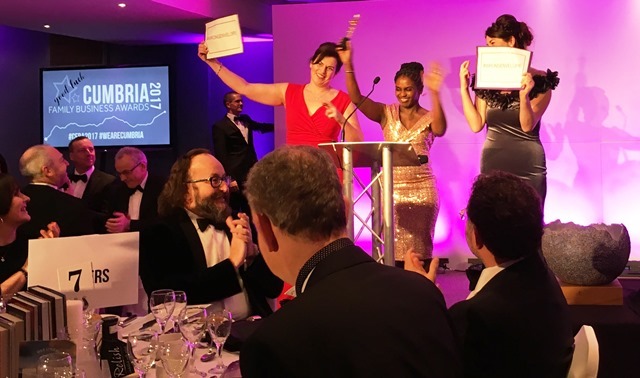 The judging panel really had their work cut out!” The tone for the evening was set as they held up the ‘Wrong Envelope‘; a reference to the recent Oscars fiasco when Faye Dunaway and Warren Beatty read out the wrong name of the Best Picture winner! “Let’s face it, you don’t choose to have a business in Cumbria to make millions. 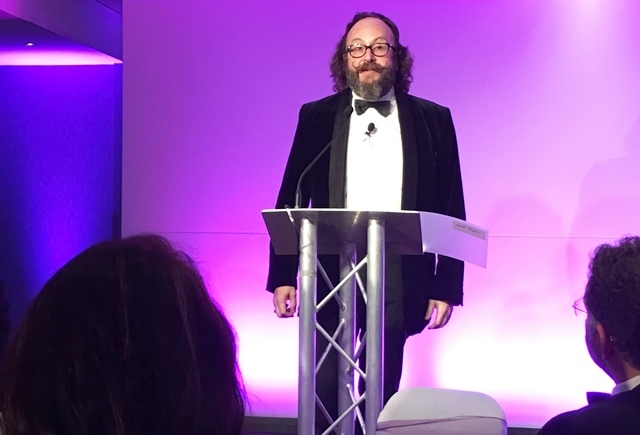 You do it because it’s a great place to live and work.” So said TV chef Dave Myers as he opened this glittering event at the Castle Green Hotel in Kendal on the edge of the Lake District. 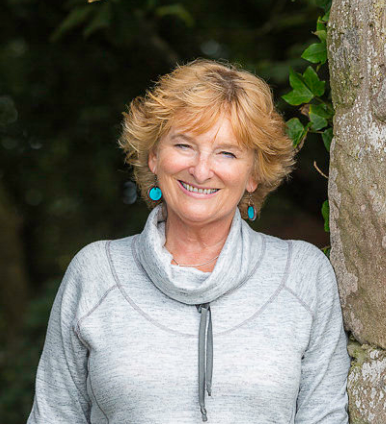 All the businesses nominated for the Cumbria Family Business Awards are family-run, and many have links with the area going back for generations. Some could move away from the area and probably be more profitable, but choose to stay in and around the Lake District because of its inspirational landscape and local links. There were 12 categories plus Ones to Watch. Finalists included well-known names such as Hawkshead Relish, English Lakes Hotels and The Herdy Company as well as lesser-known but equally significant business including The Churchmouse in Barbon, West Coast Composting and JB Banks, as small ironmongers in Cockermouth. 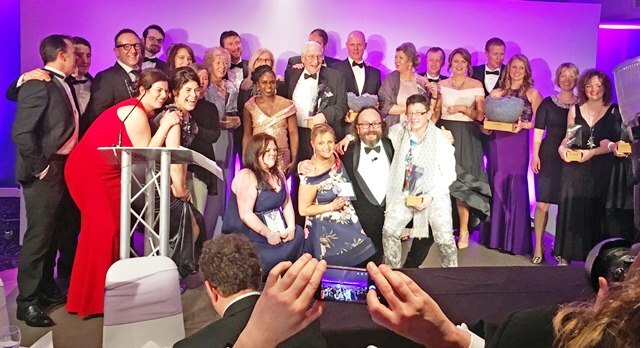 Winners included Zeffirelli’s Restaurant and Cinema (Food & Drink Establishments), PHX Training Providers (Professional Business Services), Sally’s Cottages (Smalle Leisure and Tourism Business) and Bells of Lazonby who won Food and Drink Producers AND Outstanding Cumbrian Family Business of the Year. Earlier, as guests arrived, a welcoming Drinks Reception Market served up sparkling wine and got us all in the mood. Photographer Victoria Sedgwick had us all posing for glitterati photos and Castle Green Hotel did us proud on the hospitality front. We ate very well on local produce that night. I had Cartmel Valley smoked salmon, smoked salmon rillette, beetroot, horseradish and rye bread, followed by Eden Valley chicken, fondant potato, shallots, wild mushrooms and broad beans, finished off with delicious Windermere Ice Cream and Grasmere Gingerbread. All served with excellent wines – thank you Graham Lamont! Every table had Wax Lyrical candles, bottles of Hawkshead Relish’s new product, Black Garlic Ketchup, prints by artist Daniel Cooper and also signed copies of books by Cumbrian authors to take home. I chose Dances with the Daffodils by Matthew Connolly. Dave Myers was an excellent host, bringing his inimitable humour and a local awareness that was much appreciated by everyone. He stayed on until every award had been given, every hand had been shaken and every selfie had been taken. A real gent and a great Barrovian ambassador. 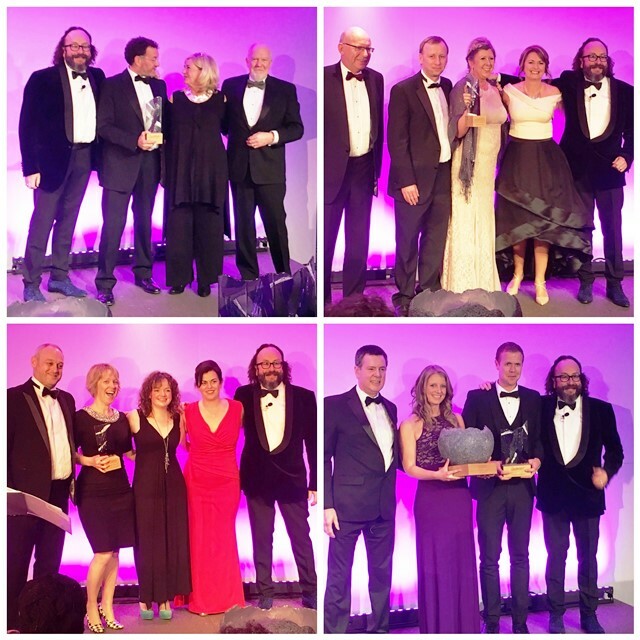 This photo of the winners sums up a great evening of fun and laughter, business excellence and Cumbrian friendliness. Many thanks to Sue Coulson of Coulson Associates, Janett Walker of Make it Happen and Sophia Newton, The Good News Girl for inviting me join in such a wonderful celebration. More CFBA photos by Victoria Sedgwick here. I stayed overnight in the Castle Green Hotel, a four star hotel on the outskirts of Kendal, in one of their very luxurious Executive Bedrooms, complete with a huge four-poster bed. See what the room really looks like; watch this short video recorded on my arrival, before the CFBA evening started. For many years I was a member of the hotel’s excellent gym; use of their Health and Fitness Club with swimming pool and spa was included in my stay. Breakfast was delicious and I was pleased to see local produce including Hawkshead Relish sauces, Cumberland Sausage, Lakeland Mues muesli, organic milk and bread from More Bakery in Staveley. Find out more about Cumbria Family Business Awards and Cumbria Family Business Network here. What a fantastic review! Thank you so much Zoë. For me the warmth in the room is testament to the people of Cumbria, friendly, innovative and creative. We can’t wait for next year! So agree Sophia – it was a very special event and a credit to all that is great about Cumbria. You’ve got a lot to live up to next year! Thank you Zoë. So many fantastic family businesses in one place doing what Cumbria does best…welcome people and have fun! Thank you for noticing the tiny details that all added up to a true celebration of our wonderful county. You did a brilliant job not only during the night but in the run-up to the event Janett. You made a lot of local business people very happy by creatign such an enjoyable celebration. Excellent review – perfect sequel to an excellent night, overflowing with glamour and elegant inebriation. Kendal was TinselTown on 10 March 2017!